Combining the summer abundance of fresh grated zucchini with flour, brown sugar, cinnamon, nutmeg, ginger and cloves in homemade zucchini bread is a treat for the whole family. 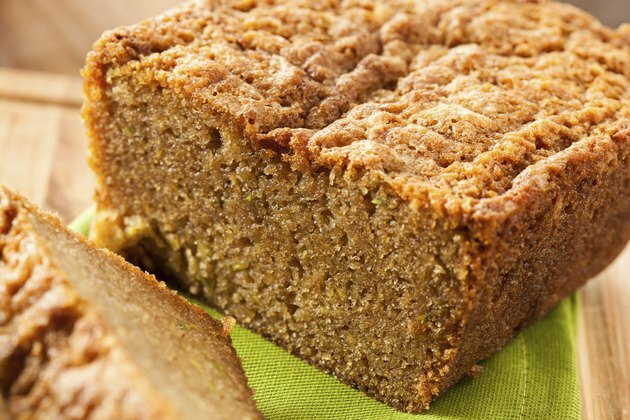 Though zucchini bread is more of a cake, the addition of fresh grated zucchini lends it a healthy element. Zucchini should be thickly grated when used in bread, with the skin on; the skin adds color to the bread and vitamins and minerals to your body. Cut both ends off of the zucchini and scrub it with a vegetable brush under warm running water. Make sure to remove any dirt from the outside of the zucchini since you will keep the skin on for grating. Set a standup box grater on a plate or cutting board on the counter. The plate or cutting board will catch the grated zucchini. Shred the zucchini by continuously running it over the large holes of the grater. Prepare the fresh zucchini by cutting both ends off and cleaning the skin with warm water and a vegetable brush. Affix the grating attachment to your food processor and turn it on. Cut each zucchini into several smaller pieces for easier grating. Place the zucchini in the shoot of the processor to grate. Collect the grated zucchini to use for the bread. Choose smaller zucchini that are 8 to 10 inches in length - larger zucchini tend to be dry, tough and bitter. Add chocolate chunks and cinnamon to your bread for a decadent and flavorful treat.